(Bloomberg Opinion) -- Strange as it may sound, gasoline is turning toxic for the oil market. West Texas Intermediate crude oil dropped below $60 a barrel on Friday morning for the first time since early April. The go-to reason is that sanctions on Iran have been a damp squib (for now, anyway). But there’s also a more prosaic problem: The bottom has been falling out of gasoline. Nymex gasoline has dropped by a quarter since the end of August, a steeper slide than the fall of 2014, the beginning of the oil crash. The problem is weak demand matched with curiously burgeoning supply. U.S. gasoline consumption – the single biggest pool of demand for oil anywhere –has flattened again. As I wrote here, take just one state, Texas, out of the equation, and demand would be shrinking outright. With diesel margins like that on offer, U.S. refiners can stomach some weakness in gasoline. And therein lies a problem: So far this year, for every barrel of distillate churned out by U.S. refiners, they have produced two barrels of gasoline. This is the conundrum: the world demands more distillate, yet producing that means also pushing more gasoline onto the market. Gasoline’s apparent stubbornness in the U.S. refining yield, along with a rising share of even lighter products, suggests the shale boom is playing a role. Oil produced in formations such as the Permian is classified as light. Conventionally, this would be thought of as a premium grade of crude, as it yields products that usually have a higher value, such as gasoline. Right now, though, a growing proportion of gasoline looks less like a premium product and more like a by-product of making diesel. And shale’s lighter crude is simply geared to a higher cut of gasoline relative to heavier grades produced elsewhere. U.S. light oil is expected to contribute the vast majority of new non-OPEC oil supply over the next five years. Yet it is unclear how easily the global refining system will absorb it. While diesel makes up only about a fifth of U.S. oil demand, it’s closer to 30 percent for the rest of the world, and international refineries are geared toward processing medium and heavier grades of crude. Something has to give here, and there are signs of some refiners on the East Coast and Midwest having cut back a little recently. Roughly half the country’s capacity is on the Gulf Coast, though, and those plants are actually running hotter. The resilience of those Gulf Coast refineries, much like those resilient frackers further inland, is rippling out into the global oil market. 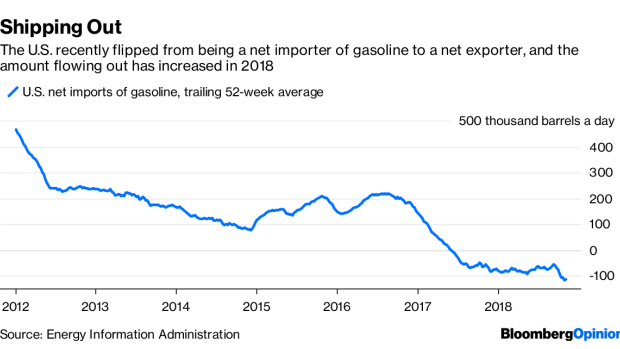 As U.S. gasoline exports rise, they’re competing with other refiners, especially those in Europe, which traditionally exported their excess stateside. As the Energy Information Administration pointed out in its latest short-term outlook, gasoline cracks in northwest Europe have turned negative already, and Singapore’s have also dropped to their lowest level in years. More refiners, particularly marginal ones in Europe and the East Coast of North America, will take the hint from margins and cut activity further. And since it is refiners, rather than you or I, that buy crude oil, that means demand, and price, for crude will also suffer. As energy economist Phil Verleger is fond of saying, crude usually follows products when it comes to pricing. The upshot is that, besides the very visible wildcards of Iran, Venezuela and OPEC policy, deeper currents are moving oil prices. The gasoline glut will act as a drag on them. Yet refiners throttling back will also dent the supply of diesel, strengthening those margins and pulling oil prices, particularly for medium grades, in the opposite direction. High diesel prices are a problem already for key sectors of the global economy, such as trucking, and new regulations on ship emissions in 2020 could cause a spike in the near future (see this). Hedge funds’ net length in the major crude oil and refined-product futures contracts has halved since January amid a wider drop in open interest. Clearly, there are fewer bulls around. Given everything at play in 2019, though, it’s possible the smart money is just feeling bewildered.